I don’t know if there are many prettier settings for an airshow. Air show season is really the best part of summer when you think about it. It what other venue can you enjoy time out on an airfield, watch amazing performers push the laws of physics to their limits, and get a hamburger/churro/lemonade/ice cream/etc. Interestingly, even as a kid with a dad that loved airplanes I don’t ever remember going to an airshow growing up. 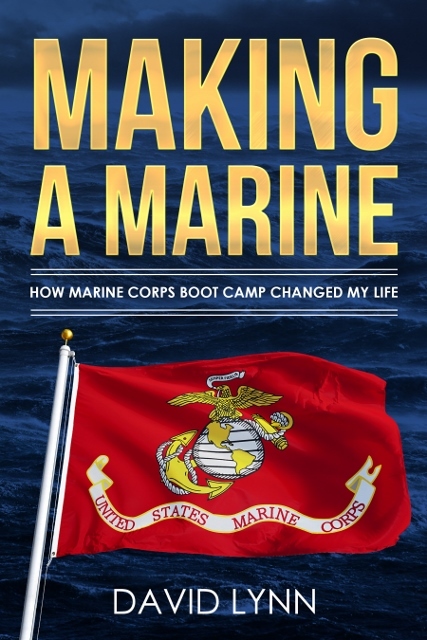 We would go to airports early to watch planes take off and land, we even went to a few boneyards and aviation museums and all of the fun those entail, but I don’t ever remember an air show. While I have not made up for it as much as I would like as an adult, and the Holy Grail of airshows remains in my future somewhere, I have still had the pleasure to witness some amazing feats of aeronautical skill. Having lived in Pensacola, we got to see the Blue Angels practice all summer long, and enjoy their homecoming show in the fall, which is still one of my favorites. 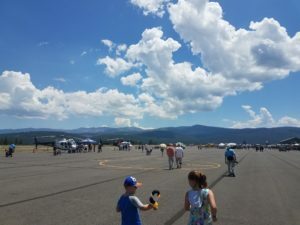 Even having been to much larger air shows, the Truckee Air Show this last weekend was a super fun air show to attend. There really is no such thing as a bad airshow, so I guess I shouldn’t have been surprised. The performer list was not very long, but it was incredibly impressive. We walked up to the show as the original T-6 Texan was performing its show. I will never tire of watching those old machines do their work. They truly were marvels of engineering in their time, and leave me in awe to this day. Unfortunately, as we got to the show my kids were immediately distracted by facepainting and crafts and food so my viewing was limited to a couple of glimpses of the Red Bull team as they closed out the morning session. This is why airshows are awesome. 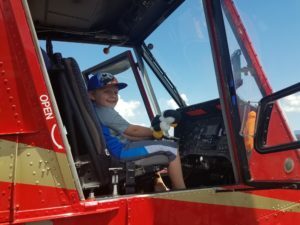 My son getting his hands on a firefighting helicopter, no idea what kind to be honest. To their credit, the airport did a fantastic job of including all sorts of activities to keep kids engaged and having fun. It is sometimes hard for me to remember that not everyone would rather sit on the hot asphalt with their head tilted back in complete and utter jealousy of the incredible flying going on overhead. It actually worked out though as we finished lunch just as Barry BDog Hancock in his T-6 was taking to the sky again and we got to watch his entire show. He was followed by Rich Perkins in his Yak 54 which was incredibly nimble following the massive T-6. It is always fun to watch the different types of airplanes. The wide range of capabilities that they represent provide such a beautiful contrast to the event and demonstrate how truly unique each aircraft and pilot is. This theme continued on with Anna Serbinenko in her Super Decathalon. She is a self-proclaimed sky dancer, and I must say she lived up to that title. My wife was confused as to why there was some sort of Italian opera music playing while Anna flew, but it was incredibly fitting with the way she was flying. The whole thing was smooth and graceful and poetic. It may have something to do with the music, but it reminded me of the scene in Shawshank Redemption when Andy is listening to the beautiful aria and just at peace with the world for a few minutes. Watching Anna handle that plane with such beauty was truly a sight to behold. I would be thrilled if my daughters could grow up to be such talented aviators. 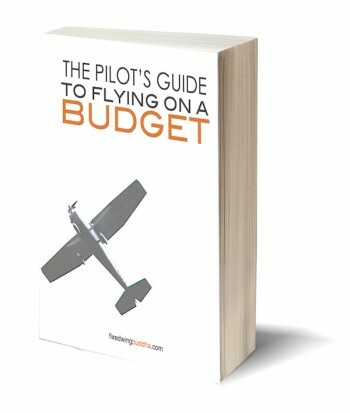 As Anna was finishing her show you could not mistake the rumble that came from the other end of the airport as the mighty P-51 fired up its engine. Even just sitting here in my living room thinking about it gives me the chills. I have been fortunate enough to see them fly a handful of times and every time is equally invigorating. I wasn’t aware of the unique nature of this show until a few minutes later when the P-51D Man O’ War took to the skies with a partner, a Mitsubishi A6M Zero. My apologies that it is not better with my phone, but seeing a P-51 and a Zero fly together is a lifelong memory that no picture will do justice. Apparently this is one of the only Zeros that actually flies in the US, and flying in tandem with the P-51 was truly spectacular. With the history that those planes share, it was simply beautiful to watch them perform together. It reminded me of flying with the Japanese C-130 during Operation Christmas Drop a few years ago. What a great reminder of the unity that can be derived amongst enemies once the conflict is over and we decide to treat each other with civility. While it would be hard to beat the magnitude of those two aircraft flying together, it would be equally challenging to beat the aeronautical abilities of the final performers of the day, the Red Bull Air Force Team. The wingsuit and parachute teams were incredible in their mastery of the air with nothing more than some nylon to guide them. To witness the work of someone with 23,000+ jumps was just incredible. The wingsuits were outpacing the airplanes which was just insane. Kirby Chambliss standing his plane up ten feet off the ground…insane. No Blue Angels, No Thunderbirds, No turbine engines at all, but I don’t know if I have ever been more impressed with an airshow. 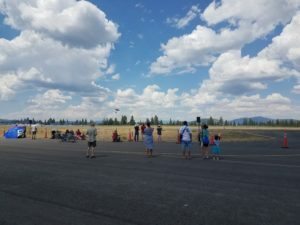 I hope that the small nature of the airshow, and the relatively small turnout are not indications of a downtrend in airshow interest, because events like this are exactly what we need to keep aviation exciting for the younger generation. So get out there and support your local air show. I can’t think of a single person that has ever said, “I sure wish I hadn’t gone to that airshow.” So why not get out there and enjoy as many as you can?